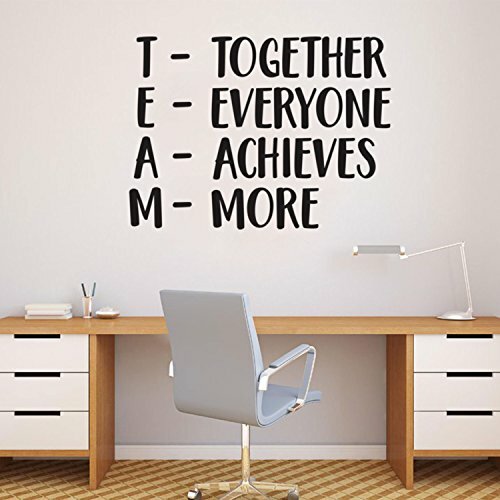 This "Together Everyone Achieves More - TEAM" quote wall art decal is motivational and the perfect touch for both indoor and outdoor decoration. It is a vinyl sticker that is easy to put onto almost any smooth surface and really brings a room together adding the perfect amount of decoration. This vinyl decal quote reminds people to be true to themselves and is inspiring. Our motivational quotes don't just brighten up the room, but brighten up the day. Using top of the line vinyl across all of our production allows us to be the leaders in quality and design. ✓ Our high quality inspirational vinyl sticker "Together Everyone Achieves More - TEAM" decal design comes in 48 inches by 36 inches. The pictures are for display and inspiration only. All of our vinyl wall decals are manufactured with premium industrial grade Lutema self-adhesive vinyls.